The moment we enter into deciding that we want to spend some time off our mundane lives, almost immediately we then wonder where or how to spend it. To most of us, travel is an instant answer. But to some, although travel is instinctive, it might not be the most practical option given the constraints that are chained along with travelling. Travel entails a lot of time, effort and needless to say, has a price tag. However, the bliss in travelling is always priceless. While the experience in travelling is incomparable to anything else, there are moments when we just want to skip the daunting task of preparing and the time it consumes, wishing we could just want to jump to the experience. Staycations which aim to deliver the vacation-like feeling inside your hotel room have become the perfect alternative. And since a lengthy list of options have flocked the internet, we are then faced with another daunting task: to choose the perfect hotel. Hotels are supposed to offer visually appealing rooms, intricate interiors, fancy amenities. At the end of the day hotels will always strive to match the taste of its guests. This makes us question; how then do we choose the right one? Unfortunately, there is no sorting hat - one that identifies the right house for you and at the end of the day, these hotels will put their best foot forward to win your heart. 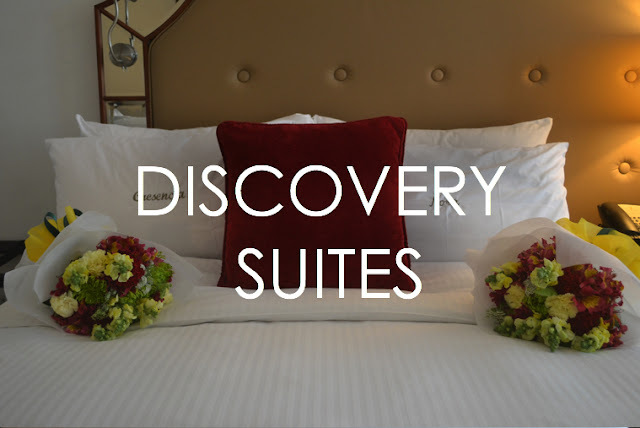 So we are left with two things to peruse: the little things and the overall experience, things that the Discovery Suites has mastered. Staycations are well enjoyed if shared with people that are dearest to us and after a while of working hard, I realized that I have given so much time to how our daily lives were expected to run that I almost forgot to spend more time with the family. Hence, I have invited my mom and my lola to indulge ourselves in a relaxing experience, an experience I feel Discovery Suites will be able to satisfy. This very experience starts the moment you enter Discovery Suites' lobby, a peculiar architecture inside the tower makes you feel at awe just by staring at the hollow center of the building, a sight uncommon to a hotel but a visual feast most certainly. This initial experience is paired with a warm welcome from the front desk and the staff who exudes the genuine hospitality as evident in their demeanor and stance. This remains consistent through out everyone in the hotel, from the lobby ambassadors to even the wait staff at the restaurants, that of which my lola lauds for being a hotel filled with courteous individuals. The one bedroom suite breathes elegance and class, an exquisite choice of furnitures creates indeed a preferred lifestyle experience. The color palette of the room is subtle but not underwhelming, a very interesting blend of earth tones and dominant colors such as red just to boost up some glow in the space. This is matched with a moderate amount of light in the entire room that keeps it lively yet calm. The hospitality doesn't end at the lobby, treats are spread across the entire dining table and a personalized welcome note are just a few of the reasons why we felt well-pampered even at the first few minutes of the stay. Discovery Suites is also coming up with a line of delectable milkshakes that is perfect for the all-year-round summer in the Philippines, my take is that it is a must try! Seeing customized pillowcases embossed with our names and the bouquets of flowers sitting on top of the bed allowed us to understand what the Discovery Suites is really all about. It amuses me how organized and well planned the team behind the Discovery Suites is, but what really pleased me more is how they go beyond the expectations and be on a constant quest to delight their guests. As the epitome of every hotel, the mattresses robed with a fresh sheet of a 100-thread count duvet and pillows that make me clingy, slumber becomes more than just an experience of sleeping. A living area that invites me to spend small talks over coffee with a splendid view of the city, or laugh together with the silliest shows on the television. The need for a "me time" isn't forgone even if the entire room calls you to bond, the en suite bathroom has so much space to move around with a bathtub that's yet another reason to enjoy. Dressed in marble, with a complete set of toiletries, it becomes an extended relaxation experience. But what is a good staycation without good food? Discovery Suites celebrates a holistic experience by designing a unique experience coupled by an amazing gustatory adventure, the 22 Prime and Restaurant 5. 22 Prime located on the 22nd floor offers an intimate set up for lunch or dinner with an array of sumptuous cuisine ranging from light and healthy courses to steaks and seafood with each plate evident to have been carefully prepared by their in-house chef. The light is purposely dimmed to set the mood for conversations while marvelling on the picturesque view of the city outside. My mom, being a wonderful cook herself is always so hard to please in dining but 22 Prime indeed got her raising her two thumbs up. Get to know more of our dining adventure at 22 Prime here. Right after a blissful dinner, we were greeted with yet again another surprise waiting inside our room. A bottle of fine wine and a platter of cheese is how Discovery Suites bids goodnight and I don't think it can get any better than that! Their consistent acts of hospitality create ripples of beatific experiences, experiences that make the moments really special. One thing that gets me excited about staycations is buffet breakfast. I normally do not fancy breakfast but buffet breakfast is always an exception. A variety of intercontinental dishes are ready to be devoured the moment we got into the Restaurant 5 which as the name suggests, is located on the 5th floor of the hotel. Contrary to the intimate mood at the 22 Prime, Restaurant 5 has a very festive mood for reasons I that I am no longer surprised with. Starting the day with a hearty breakfast from their extensive choices will surely get you pumped up. Right next to the Restaurant 5 is the semi-indoor pool with a Caribbean theme. It is visually appealing as just a portion of sunlight beams towards the turquoise waters, perfect to those who need just the right amount of heat while optically creating a glow to the pool. It is astonishing how even the pool is displayed with such a class and intricacy. Discovery Suites as an established name in the industry has so much to offer, beyond the comfort that are already conspicuous the moment you enter the room, more than the careful attention to the detail that they truly strive to give, above the gustatory perfection that they have become an expert with, Discovery Suites has made turning good experiences into great possible at every corner of the hotel, their persistent search to create remarkable moments is a reason why it feels like there is always something to celebrate - these things are probably not evident in pictures alone but are felt once you get the chance to make theirs your home. All I really wished for was to reconnect and have a wonderful experience with my family and it was with Discovery Suites that I learned how the little details can actually make that experience happen, I couldn't be more delighted to have found home in Discovery Suites.